An hour drive from Qatari capital Doha is located one of the most popular desert areas, where the Qataris are used to go regularly in January. On the way to Laweena, passing Shahaniyah rest point, this large space in the middle of nowhere, right in the heart of the Qatari desert, hosts annually thousands of worshipers. Why it’s so important to the locals? 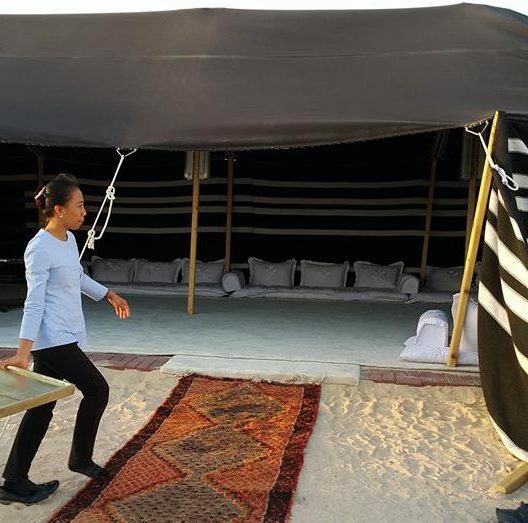 Every January, when the temperature is low enough (about 24 degrees C), a great tradition pokes all Qataris to go back to the roots, by remembering, honouring and respecting their ancestors, who lived deep in the desert, divided in tribes. I had the luck to witness that regular January invasion. Regardless the level of wealthiness and social status, all the locals literally move to the desert. Some of them stay just for a couple of days. Forced by the modern lifestyle, they shortly go back to the hectic business schedule in Doha. Others spend in the desert a couple of weeks, facing the humility of their great-great parents’ traditional way of living. I have been completely amazed by the ritual of “migration“. Probably can call myself a fortunate one for not experiencing it via a tour agency, but by accompanying a local family in that desert trip. On the way to the desert it’s likely to see lots of camel trains, as the area is popular with its camel farms. The camel races are extremely famous in Qatar and it’s a matter of pride to grow your own camel, competing it in a race. The care taken of the competitive animals could be compared with the level of the best horse farms, with proper barns, regime of feeding, daily exercises and plenty of staff for servicing the expensive competitors. It’s a marvellous view to see dozens of camels brought out for their scheduled daily walk or training. As an European, I was fascinated by the consuetude of Qatari desert “migration”. It’s inspiring to witness how the locals get excited during the preparation for the desert life. Every family buys or orders a desert home – a special tent, called RHODA. 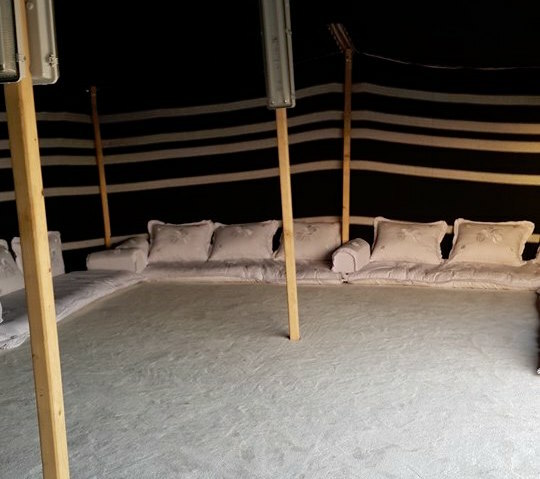 It’s made by thick fabric and gets fixed as real, but huge tent directly to the ground. To have a family tent is a matter of pride and dignity. The Qataris get this extremely seriously, which is a step on the way to honour their roots. There are signs, mostly kind of coloured flags, that designate family appurtenance. Speaking of family, I mean often more than 20 members. The Qatari families are still pretty large. Having 10 or more children is still on track. By adding all the cousins, friends and relatives, who visit the family during their desert stay, it counts a serious number of people in each rhoda. So the size of the tent depends on the number of the family members and the expected guests. Some rhodas are really enormous and that’s why they must be firmly fixed to the ground. The wind in the desert could be harsh and to seriously threaten the temporary desert home. The process of establishing the family rhoda is a ritual as well. You can’t just go and place your tents (usually more than one) wherever you want in the desert. All the areas are strictly stated and each family gets a spot, large enough to accommodate all the members. 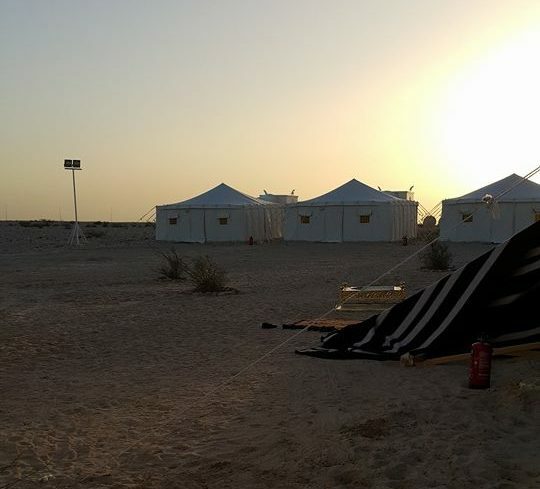 The main tent represents Majlis (the place where all the family gets together, kind of a large living room). It looks like taken directly from a fairytale of “1001 nights” and blows the foreigners’ mind away by its exotics and colours. The floor in the rhoda is covered by colourful carpets. In the past. the Qatari ancestors have seated directly at the carpets, in the best case by using pillows. Nowadays the rhoda is furnished by low beautifully decorated sofas. There is a particular separated industry, providing traditional sofas specially for rhoda. The Qataris are extremely excited by choosing, defining each family by their style, colour and specific set. 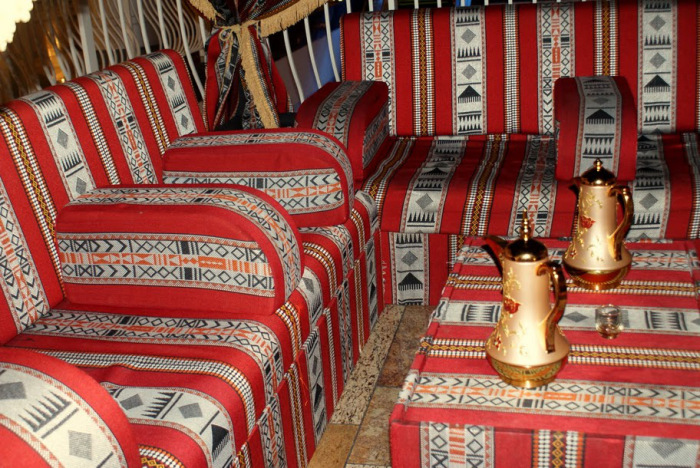 There are also low wooden tables in front of the sofas, surrounded by shisha (whaterpipes for smoking). Life in the desert is simple – you eat what you have brought and what you prepare on site, often directly over the fire. Going back to the roots, the locals cook their traditional meals – mathrooba, machbous and a communal plate of roasted lamb with rice. Believe me, it’s not that simple to pop up at such a family dinner. To be invited as a foreigner and to share the family’s large plate of lamb with rice is a gesture of great respect. The decision must be taken from the host. If the host invites the guest to share their meal, it means they value the guest. Being invited as a foreigner to the local dining is a big honour. To refuse that invitation is a big insult, so better don’t, even if you are not impressed by the meal. I prefer to never eat mathrooba, as it’s not my taste, but I skipped the comments. Along with machbous, mathrooba is the local dish pride. All Qataris adore it. Mathrooba is a meal cooked from chicken in a creamy buttery porridge. To me it doesn’t look appetising, but locals love it. Machbous is a combination of Eastern spices, basmati rice, pine nuts, raisons and either mutton, chicken or hamour fish. I love everything prepared with the local popular and very cheap hamour fish. Unfortunately, I am not the one who can really appreciate the local cuisine, because I am not a rice admirer. In Qatar daily are eaten tons of rice. Probably it’s an Indian influence, which is extremely strong around. The afternoon is the peaceful time when the family gets together for Arabic coffee routine. The Arabic coffee afternoons are similar to the English tea tradition in UK. The taste of the Arabic coffee is way not like a real coffee, but you can read more about it in my previous article, where it’s revealed in details. It’s rich of Eastern spices, bitter and mandatory served with dry dates. The dates are supposed to sweeten the taste. It’s time for fun. While drinking Arabic coffee, lots of stories were being told, also time for laughter and family reunion. I loved that time. Understanding almost nothing from the exotic Arabic language, I found myself bewitched by just listening and observing. At that moment, I was hoping to hear local women singing, but in Qatar only men are allowed to sing and dance publicly. Singing for a woman is considered inappropriate and unacceptable, doesn’t matter how talented she is. But when the female members of the family get together in their own, separated in the female Majlis, they would sing and dance, enjoying the fun of music. It’s beautiful. I had this privilege to see it. Not touched by male eyes, the Qatari women dance outstandingly. I should admit most of them are extremely beautiful with long thick black hair and underlined dark eyes. An ordinary man can’t witness that beauty, because in daily life all those gorgeous women are strictly covered, wearing abaya and niqab. My favourite time during this desert escape was the night. Because of the lack of artificial lights, the sky with all its stars looks extremely low and bright in here. It’s an amazing experience to observe firstly the desert sunset and then the night sky. The sun, while setting, moves so slowly and looks so big, orange burning, that the view seems unreal. I am able to watch that picture again and again and will never get enough of. Because the desert is completely flat, nothing hides or ruins the sunset atmosphere. It could be watched entirely till the sun completely disappears behind the horizon. A magical experience, surrounded by absolute silence and ease. Nothing moves around, no animals, no birds, no signs of modern life. After the sunset, each family makes bonfire and sits around it. It’s a remainder from the tribal culture, where the fire was a sign of life and strength. Here, close to the fire, sitting at the outer carpet, surrounded by colourful pillows away from the rhoda tent, comes an ancient breeze. I felt like going back for centuries. A sky full of bright stars above and the desert ground underneath, quiet and peaceful ….not sure I can even describe it. As the locals explained to me, being away from the city, leaving behind the contemporary life gadgets, teaches humility. It really does. 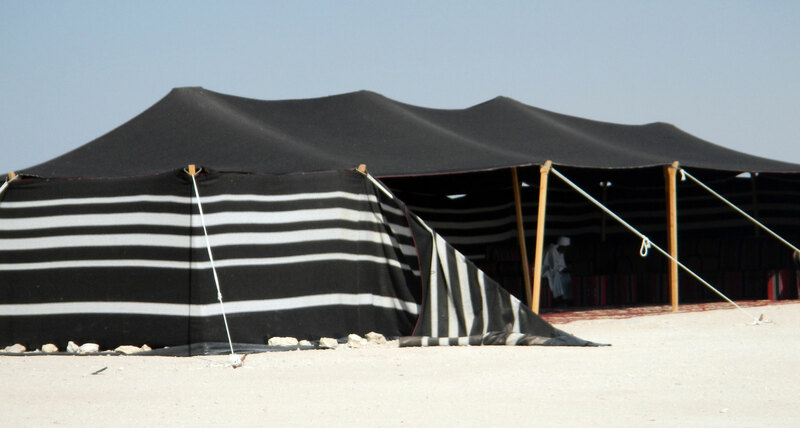 In the desert the Qatari families feel their connection with the ancestors as nowhere else. They go back to their roots, to the tribes they belong to. Keep alive the rituals and the traditions of the great great parents, eat the same food, sleeping under the same stars. I definitely miss the right words to explain how it made me feel as an ignorant foreigner among them. Honoured, speechless and grateful to share that desert experience. It’s definitely worth it and is truly unforgettable to be a part of the “migration” to the desert in January. Well… nowadays, close to the rhoda tent, are located modern bathrooms. Cell phone reception is available on site. Also big TV screens are set in the tents, which makes the desert adventure easier and funnier. 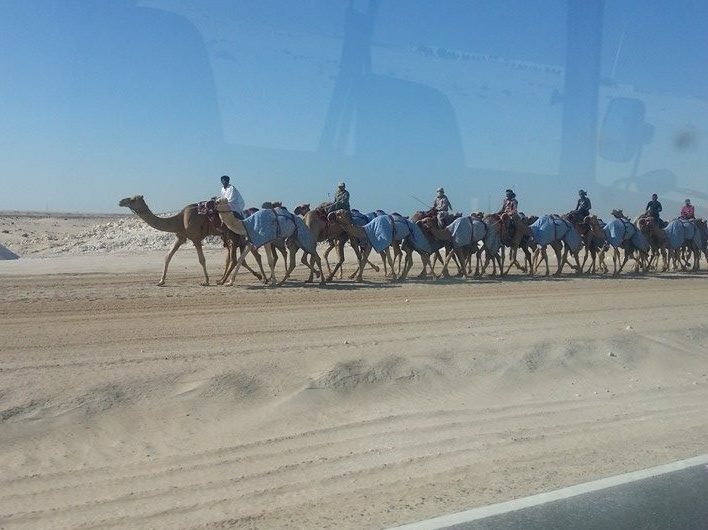 The desert invasion happens by SUVs, not by camels. But once in the desert, the fairytale begins. I won’t forget the desert sunsets and the atmosphere that threw me directly to the past, honouring the tribal desert culture, source of humility. It turns to a wake up call for the modern Qatari citizens, who admire their roots by this regular January desert migration.